Do dazzling flashing lights in the shape of reindeers make you anxious? Does the sound of carols fill you with dread rather than joyous anticipation? Would you rather hide under a stone than face the stampede of the shopping hordes? You are not alone. Strategically placed only 6 shopping days away from the festivities, Anxious Xmas is an irreverent celebration of all things vexatious about the build-up to the most wonderful time of the year. Performances ranging from meditative to humorous to cathartic will provide a valve to release tensions, and a tonic to soothe stressed souls. Usurp’s own “The Conspirators of Pleasure” (Poulomi Desai + Simon Underwood) will intensify the treatment with a sound collage ranging from melancholic drones to noisy chaos, created with the help of an amplified sitar and a range of sonically twisted toys and machines. Visitors’ Christmas anxieties will be turned into music in an impromptu improvisation by vocalists Blanca Regina and Sharon Gal, with Steve Beresford (Usurp) on piano. Luke Goaman-Dodson’s Mundus Inversus will sing praises to the winter solstice with post-rock including Tuvan throat-singing and medieval tones. Gregor Riddell and Rob Lewis will steady jittery nerves with an ambient cello and electronics performance. Finally the Material Studies group will invite everyone to join in a collective improvisation rite, where objects carrying festive associations will be relieved of their symbolic meanings and instead be treated as materials to make a joyful noise with. 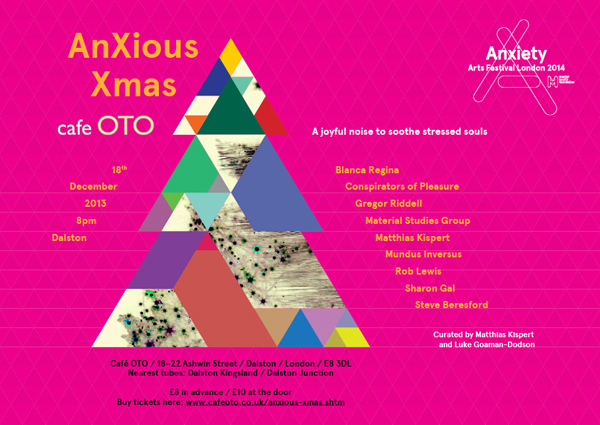 The AnXious Xmas event is part of Anxiety 2014 – a London wide arts festival taking place in June next year, that will explore the medical concepts of anxiety and the way they are lived, perceived and represented by individuals and communities. Anxiety 2014 will engage the public in a positive dialogue about mental health, challenging the stigma and discrimination that often surrounds it. The festival will showcase a dynamic programme of visual art, film, performance, music, dance, theatre and talks, in a number of venues and spaces across the city, from grass-roots community centres to London’s leading cultural and academic organisations.